Increase your vocabulary and you’ll make your writing much more precise. That’s why I provide a word of the week. Today’s word: giddy. Behind the Beautiful Forevers by Katherine Boo reads like a novel. 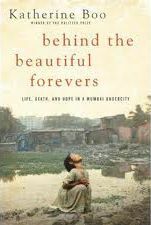 In fact, it’s a true story — in the fashion of narrative journalism or creative non-fiction — describing the lives of about half a dozen people who live in a slum outside of the Mumbai airport. How I wish I could recommend this book wholeheartedly! The story is heartbreaking and it represents four years of hard reporting by the author as well as I-don’t-know-how-much-time writing. But the hard truth is the book just wasn’t well-written enough for my taste. I found it surprisingly “flat” for a story in which character’s lives were at risk. In my mind’s eye, I began to dismiss Katherine Boo as simply a mediocre writer. But I changed my mind when I read her “afterward,” which explained her reporting process and expounded on her feelings about India. Tightly written and provocative, it convinced me that she knows how to write passionately and persuasively. Bottom line? I think she made a mistake in taking a narrative journalistic approach to this work. I would have been far more interested to read a more traditional piece of reporting. The dirt roads twisting upward from the tea stall had been giddy with chickens, which reminded him of his native village. I’m sure I don’t really need to define the word giddy for you. As an adjective it means having a sensation of whirling and a tendency to fall or stagger and as a verb it means making someone feel excited to the point of disorientation. But I’d never before seen it used to mean “filled with.” But isn’t it perfect? Giddy captures the whirling of the birds, and, I think because so often children are described as giddy, it adds a welcome sense of frivolity.